Based on the writings of Tāranātha. 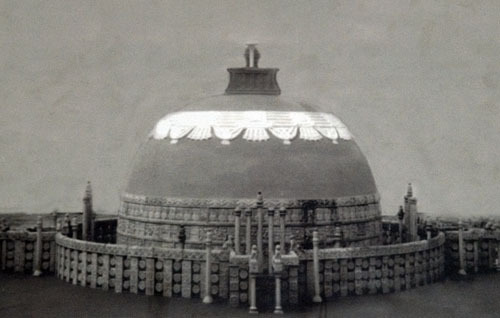 Conjectural reconstruction of the great stupa of Dhānyakaṭaka, Amaravati. National Museum, New Delhi. On the full moon of the month Caitra in the year following his enlightenment, at the great stupa of Dhānyakaṭaka (dpal ldan 'bras dpung kyi mchod rten), the Buddha emanated the mandala of "The Glorious Lunar Mansions". In front of an audience of countless Buddhas, Bodhisattvas, vīras, ḍākinīs, the twelve great gods, gods, nāgas, yakṣas, spirits and fortunate people gathered from the 960 million villages north of the river Śītā, was requested by the emanation of Vajrapani, the king Sucandra (zla ba bzang po), to teach the tantra. He had divine workers construct from jewels a maṇḍala palace of Kālacakra, 400 cubits across. He taught the mantrayāna to many humans and many of them achieved the highest realisation. In the second year after the teaching of the Mūlatantra, having installed as regent his son, the emanation of Kṣitigarbha, Sureshvara (lha'i dbang po), he passed on. 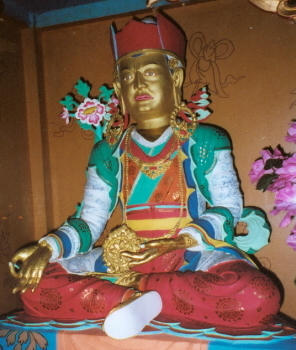 After him came other emanations of tenth level Bodhisattvas: Sureśvara (lha dbang), Tejī (gzi brjid can), Somadatta (zla bas byin), Sureśvara (lha'i dbang phyug), Viśvamūrti (sna tshogs gzugs) and Sureśāna (lha'i dbang ldan). They also spread the teachings as did Sucandra. After them (a total of 7) the King Yaśas (grags pa), an emanation of Mañjuśrī, similarly taught the Dharma for a hundred years. As prophesied in the Mūlatantra, he saw that the 35,000,000 Brahmin sages who lived in the 96 regions were fortunate, and that it was time to convert them. He understood that if they were not converted their descendants would in the future become barbarians (mleccha, a Sanskrit term for any foreigner not following Indian customs, but here specifically refering to Muslims). He also understood that if they entered the Mantra teachings, then all the people of the 96 regions would enter the Mantra path. As they were so attached to their evil views and practices they would not adopt the Vajra caste, and, giving up their own land, prepared to leave for India, driven out by this fierce command of the King. They travelled south for ten days, arriving on the tenth day at a great forest. The King subdued them into a deep sleep, and instructed non-humans, without waking them, to carry them instantly into the sky and transport them to the centre of the Mālaya grove, in front of the maṇḍala that had been erected by Sucandra. There, they were woken up, and were greatly surprised. The minister Sāgaramati (rgya mtsho'i blo gros) explained the symbolism of the mandala to them, and at the request of Sūryaratha and the other sages they were given the empowerment of the awareness maṇḍala and were taught the text known as the Kālacakra Laghutantra (dus kyi 'khor lo'i rgyud kyi rgyal po bsdus rgyud) which condenses the meaning of the Mūlatantra. This text, summarised from the Mūlatantra, contains 1,030 verses in sragdharā metre. As the Mūlatantra is composed in anuṣṭubh metre, measuring it in that metre it is about 3,000 verses, and so the Laghutantra is about one quarter the length of the Mūlatantra. So, on the full moon of the month of Caitrā (nag pa – this is taken as the third month in the Tibetan calendar, but is considered the first in the Kālacakra calendar), the sages were given the empowerment and explanation of the tantra. One month later, on the full moon of the Vaiśākhā (sa ga) month, all the sages achieved the non-dual awareness-kāya. After him (King Yaśas) came the emanation of Avalokiteśvara, Puṇḍarīka. He composed the commentary on the Laghutantra, the Vimalaprabhā, in 12,000 verses. As in this way the sages of different castes were turned into the single caste of the Vajrayāna, and from the time of Yaśas onwards, these kings were called Kalkī kings, meaning of one caste. To here from King Yaśas, there are twenty five. One of these kings, Viṣṇugupta, travelled magically to Kashmir, erected there a stone pillar, and taught the Vajrayāna there for three months. When he taught the dharma the earth shook and lights were seen. He went often to the Nāga palace in a Kashmiri lake and displayed many illusions such as the Nāgas actually listening to the teachings. 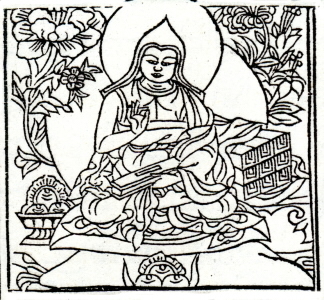 He wrote sadhānas for Vajravārāhī, Ekajatā and others. He was known as the "One who came from the sky". This appears to have been around the same time as the great teachers Dignāga or Dharmakīrti, were spreading the Dharma. 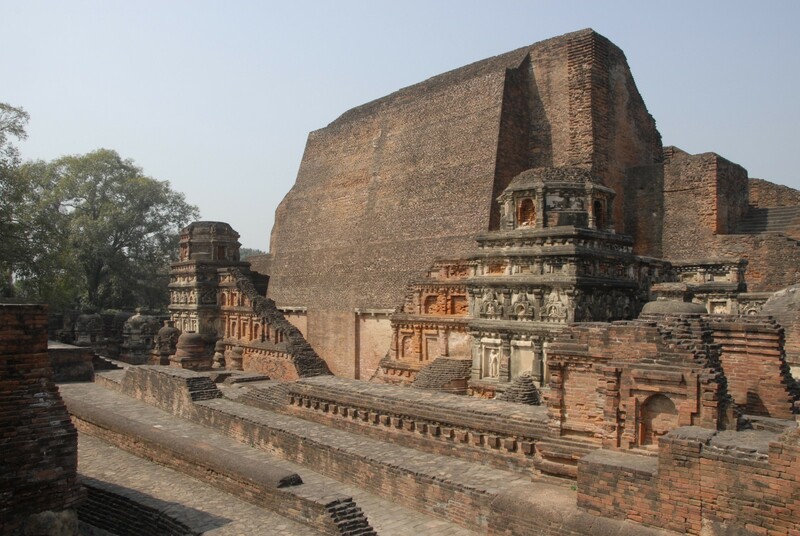 At the time of the Kalkī King Aja (11th), the Kālacakra went to India. Currently, the lion throne (Tāranātha was writing early in the 17th century) is occupied by Śrīpāla, and from the time of the Dharmarāja Sureśvara up to Anantavijaya, each has reigned for an equal period of 100 years. Like the previous kings, Raudra Cakrī will also teach the Dharma for 100 years, and then will fulfil his commitment to vanquish the barbarians. Around the time that Arkakīrti (8th) ascended the lion throne, in the land of Mecca the barbarian teachings spread widely, and it appears that when these teachings first reached the western part of India, that this was the time of the barbarian teacher Madhumati. From that time up to the present, these teachings have spread considerably. However, in the future, when the area south of the River Śītā has all become barbarian, the time for the barbarians' defeat will have come, and Cakrī's emanated armies will overcome them them. The emanations will appear to kill the barbarians, pacifying their arrogance and having brought them to the true path, the emanations will return. Then will start the Kṛida age (yuga). Cakrī will have two sons, Brahmā and Sureśvara. In the lineage of Sureśvara will arise very many, Kāśyapa and others. They will traverse the twelve great regions, through a period of 21,600 years, suppressing the barbarian teachings and spreading the true path. This much is well known, but as the stories of the bodhisattvas are secret and inconceivable, the arrogance of further analysis makes it difficult to be certain of any more. How the teaching spread in India and Tibet. 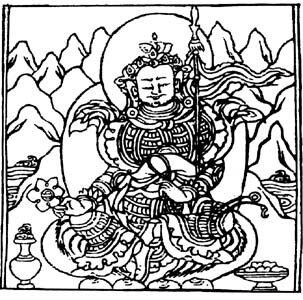 Regarding the spread of these teachings in Tibet, the stories connect with many Indian traditions. Also, in Tibet there were many traditions: those of "gyi co lo tsā ba zla ba'i 'od zer", "rma dge ba'i blo gros", "'a zha rgya gar brtsegs", "khyung po chos brtson", "rwa chos rab", "rtsa mi sangs rgyas grags", etc. 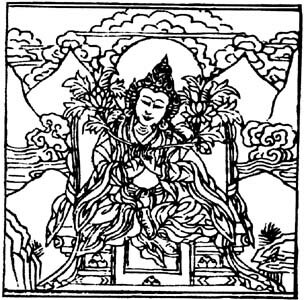 The most important was known as the tradition of the translator Dro ('bro) or the tradition of Somanātha. According to this tradition, there was in India the son of a Yamāntaka yogin. 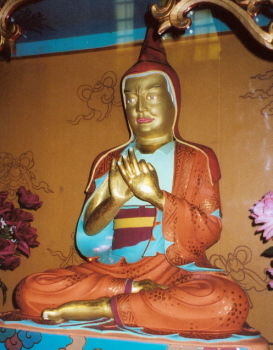 He was known as Mahākālacakrapāda (or, Kālacakrapāda the Elder), although his real name was Mañjuvajra. He was a paṇḍita skilled in all sūtras and tantras. He was an Upāsaka. He had a vision of Mañjuśrī in which the yidam told him to travel north. This he did, and on the road he met an emanation of the Kalkī king. He received empowerment and performed the profound yoga for six months, obtaining the power of miracles, and travelled to Sambhala. There he met the real Kalkī king and received many tantras, of Kālacakra and so forth, and the three fold cycle of commentaries of the bodhisattvas (Kālacakra, Hevajra and Cakrasaṃvara). Committing some of these to memory and taking others as texts, he returned to India. He mainly practised meditation and exhibited many miracles, such as suppressing with his gaze many Hindus. He finally passed into the rainbow body. He had about twelve students and they all became just yogins. All exhibited many signs and illusions, but, passing into the rainbow body, there was not much benefit for the tradition. Part of the remains of Nālanda University, Bihar. This building is said to be on the site of the original structure – the stupa holding the remains of Śāriputra, one of the Buddha's two main students, who was both born and died at this place. A temple built here by Aśoka is sometimes considered to have initiated the development of Nālanda. The one known as the Younger Kālacakrapāda, whose real name was Śrībhadra, alone spread the teachings. He was from the Vaiśya caste, was an Upāsaka, and was expert in all the yānas. He possessed many supersensible cognitions, could not sink in water, and was unimpeded by walls and mountains. He gave a discourse to 500 paṇḍitas at Nālanda and impressed everyone with his speech, and all, except Vāgīśvarakīrti and Prajñākara bowed down to him. He said that these teachings would spread over the whole earth, and that kings, ministers and great merchants were even developing an interest in the texts and developing dispositions (towards the teachings). If it would not come to India, where else would it go? From now on, placing all Kālacakra siddhas on one side and all siddhas of other traditions on another, the Kālacakra siddhas will be the greater in number. The son of the lesser Kālacakrapāda was known as Nālendrapa. His real name was Bodhibhadra and he was the owner of the land of Nālendra (sic). He practised all four activities but only achieved realisation of the yoga of wind. He had many students, but here, the important one is the Kashmiri paṇḍit, Somanātha. 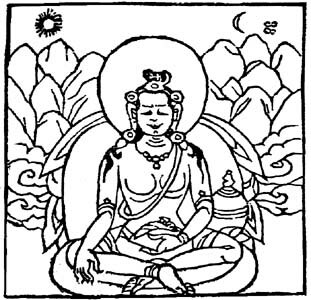 Somanātha (zla ba mgon po) was very intelligent, and could memorise about sixteen verses with each breath. He studied with the teacher "The good Brahmin", and in Kashmir learned all dharmas. Later, he travelled to the centre of the country and at Nālendra he listened to many profound Vajrayāna teachings such as the Kālacakra. In practice, he fully accomplished Prāṇāyāma and Dharāṇā, his movements of bowel and urine ceased, and he had many powers such as being able to petrify thieves by just pointing at them. 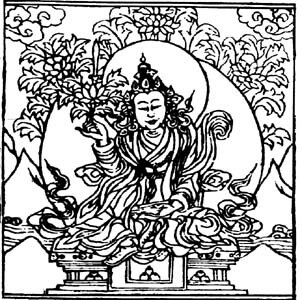 He travelled to Tibet three times, and taught many teachings, including the Pradīpodyatana (sgron gsal), the six Treatises (on Mādhyamika), and the five Treatises of Asaṅga. In particular he widely spread the Kālacakra. Last updated 2 October 2015.